Sky Go, formerly Sky Player and Sky Anytime, is an online service for Sky TV customers. It allows them to stream Sky programming on devices other than their television and Skybox. As the name suggests, customers can use the service to watch Sky on the go. Sky Go is free for current Sky TV customers. The content that you can access on it depends on the subscription that you pay for. Basic Sky TV subscriptions start from £22 per month, with packages such as Sky Cinema and Sky Sports available for additional fees. Watching Sky Go requires an internet connection unless you upgrade to Sky Go Extra to download content. This upgrade will cost £5 a month, but it is also free for Sky Multiscreen customers. Read this comprehensive guide to find out how to use Sky Go and get the most from it. When you are already a Sky TV customer, you can sign in to register for Sky Go. You must create a Sky iD to be able to access Sky Go and log into your online Sky account. 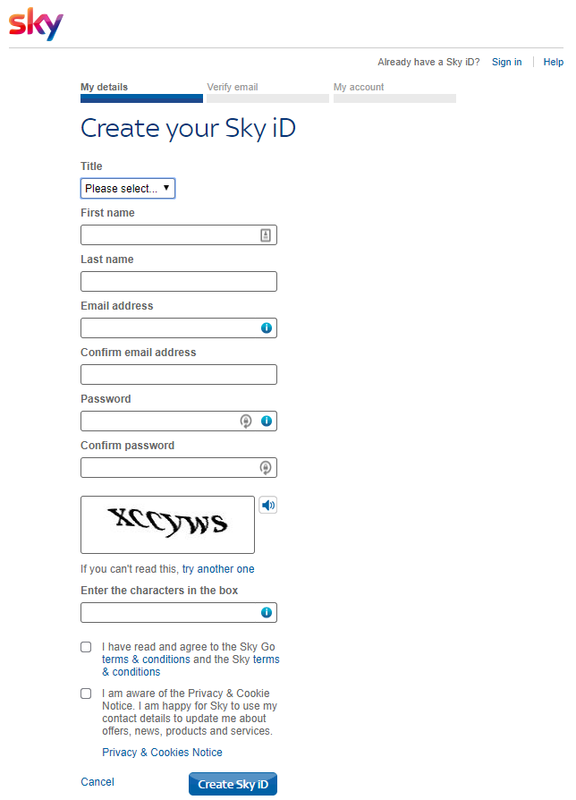 If you already have a Sky iD, you can just sign in right away. In order to use Sky Go, you must first download the Sky Go app on a compatible device. It is available for free in the App Store for iOS and the Google Play Store for Android. Other than mobile devices, including tablets, you can also watch Sky Go from a laptop or desktop computer. You will have to download the free app for Windows or Mac to do this. You can also view Sky Go via Fire OS by downloading the app from the Amazon Appstore on Kindles/phones. 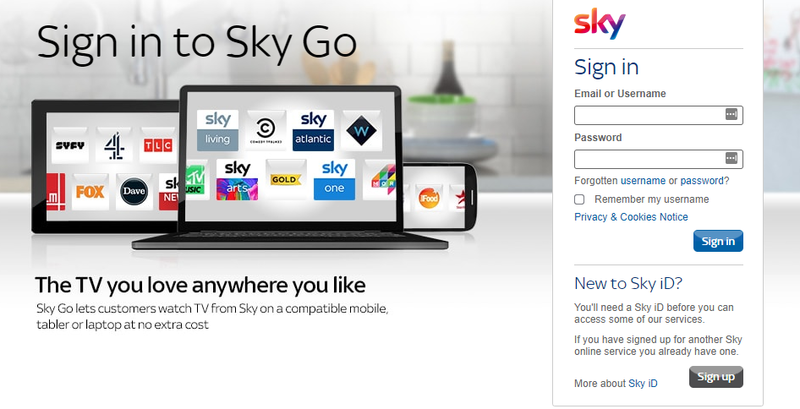 To manage all aspects of your Sky account, including Sky Go, simply sign in online. If you just want to manage your account in general, you will also be able to view and update it on your TV. Create a Sky iD as above if you need one. You will be able to pay bills and amend subscriptions if you want to reduce or upgrade them. This is where you can upgrade to Sky Go Extra for an added cost, or cancel it if you decide to unsubscribe and downgrade to free Sky Go. With the basic Sky Go service, you can sign in to use it on 2 compatible devices. This means you can download it on your laptop and your phone, or two people can each access it on one of their devices. If you want to be able to access Sky Go on up to 4 devices at once, then you’ll have to pay for Sky Go Extra. You should remember that the device limit does not only apply to Sky Go, but to all Sky apps. This means that the Sky Q and Sky Kids apps count towards the standard two-device maximum. You can have multiple Sky apps on the same device, though, as it will only count as one registered device. There is also a limit on changing devices. Removing a device doesn’t count as a change, but you can only add or register one new device per month. You can add or remove devices in the app by going to “Manage Devices” in the Settings area. This should be the same process regardless of the type of device. 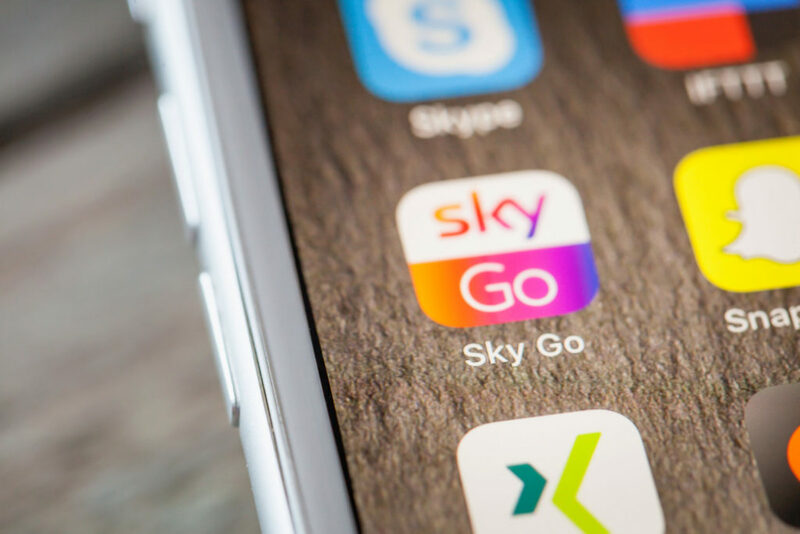 As well as being able to use it on more devices, the benefit of Sky Go Extra is being able to watch content without an internet connection. You only need to connect to Wifi or broadband to download programmes or movies. Then you can watch them at any time without having to stream online. You can get a free trial of Sky Go Extra for up to 2 months. It can take up to 24 hours for Sky to activate the upgrade when you sign up for Sky Go Extra. Click on the download button on a programme to download it. You can even download it to your Sky box instead if you prefer. Each household can only download a programme twice with Sky Go Extra before it is available for streaming only. You can only download one thing at a time, but you can queue things to download. Downloads will be available in the app for 30 days, but once you start viewing, you will have 48 hours before it expires and automatically deletes. If you are a Sky TV customer travelling within the EU, then you can still use Sky Go on a compatible portable device. You can watch, stream, and download Sky content on your phone, tablet, or laptop in the same way that you would in the UK and Ireland. The streaming quality and speed of any downloads will depend on your internet connection, wherever you are in the EU. You can view content abroad for up to 30 days before Sky will send you an e-mail. This will ask you to stream content from in the UK or Ireland to confirm that you are still a resident there. You will have 7 days to do this. This also applies to using all of the other Sky apps in the EU, including Sky Sports and Sky Cinema. After downloading the Sky Go mobile app and signing in, you can start viewing. Click on “TV Guide” in the menu to find live TV to watch. Then tap the play button on a programme to watch it. You may not be able to view all of the Sky channels live on mobile devices. However, you can still remotely select to record it on your Sky box. To view on demand, click on “Catch Up” or “Sky Box Sets” in the menu instead. If you have Sky Go Extra, then you will be able to download programmes to watch later. Unfortunately, you can’t access Sky Box Office events in the Sky Go app. Whether you use a desktop computer or a portable laptop, the Sky Go app will be the same. It is very similar to the process of using it on mobile phones or tablets. The menu will be on the left side and you can select the TV Guide, Catch Up, or Box Sets and browse the categories and channels from there. As with Sky Go on phones and tablets, you will only be able to view Sky Cinema or Sky Sports if you pay for those additional subscriptions. You can press play to stream a show, opt to record it to your Sky box instead, or download it in your app if you have Sky Go Extra. What Sky customers who have gamers in the family might not know is that they could use Sky Go on their console. However, you can only do this if you have a Sky Go Extra subscription. You will need to have enough space on the hard drive to install the “TV from Sky” app on the console. This can be found in the “TV & Video Services” section. You will have to sign in with the Sky iD to access it. This applies for PlayStation 3 and PlayStation 4. For Xbox 360 and Xbox One, you can download the Sky TV app after signing into Xbox Live. You can find it in “Video Marketplace” on Xbox 360 or in Xbox One apps. You can then use the console controller to browse and select content to watch. If you are having difficulties trying to access Sky Go or view the content on it, then use Sky’s online diagnostic tool. Select which device you are using and then what you are trying to do. It can provide guidance on signing in, or fixing issues with the picture or sound. It can help you to identify and rectify error messages that you may be receiving on Sky Go. If after reading and following all of the advice online you still can’t fix the problem, then you should contact Sky for help. You can get in touch by calling Sky on the phone, using the live chat to talk to a Sky agent through your online account, or sending an e-mail to mysky@sky.uk with your details. They should be able to help you in fixing it.